Mention the name Lenny Johnrose to any Swansea City fan from the pre-Premier League era, and you’ll no doubt be told about how the tough-tackling defensive midfielder helped keep the Swans in the Football League during the 2002/03 season. No-one in these parts will ever forget the nerve jangling 4-2 final day win over Hull City at a sodden Vetch Field in May 2003, a game in which the Preston born Johnrose, scored the all important third goal which put the Swans in the lead, before local lad turned local hero, James Thomas, finished the job with THAT sublime lob. The great escape had been achieved. Fast forward to March 2017 and sadly the joy that surrounded the mere mention of Lenny’s name, turned to sadness, with the news that he had been diagnosed with motor neuron disease (MND). In August this year, Lenny went public on his battle with the disease. Duly, the Len Johnrose Trust was formed, with the aim of raising funds and awareness of MND, whilst helping Len and his family. Given Len’s strong links with Burnley and Swansea, having played over 120 games between both clubs, during a career spanning over 430 appearances, it was little wonder that fans of both clubs wanted to do something to raise money for the Len Johnrose Trust. Step forward the Burnley FC Former Players Association, run by Veronica Simpson, former Burnley player Steve Davis and Swansea Legends organiser Gareth Winston, whom together have organised a charity football game between Burnley Legends and Swansea Legends, which needed to be played as near as possible to Len’s home in Lancashire. 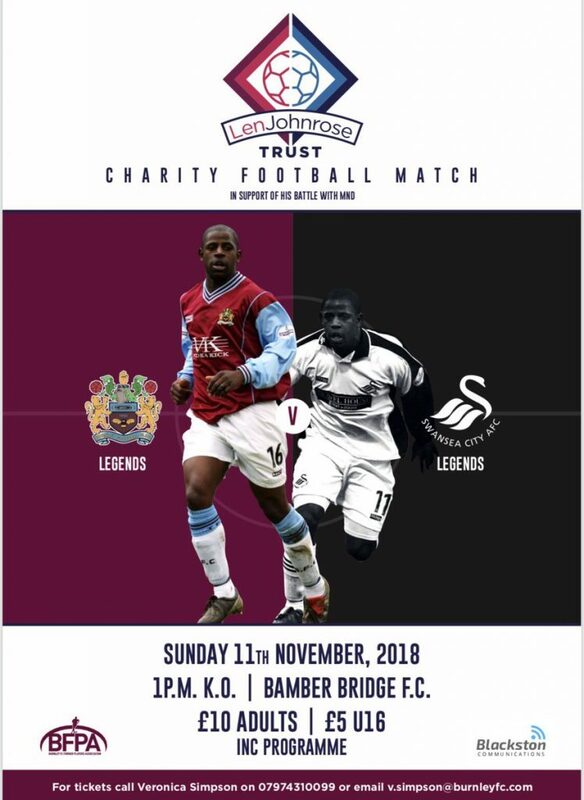 The Burnley legends vs Swansea City legends charity football match in aid of Len Johnrose Trust, is being played on Sunday 11th November 2018, at the Sir Tom Finney Stadium, home of Evo-Stik NPL Premier Division side Bamber Bridge. Kick-off is at 1pm and the referee for the game will be former Premier League official Mark Halsey. Tickets are priced at £10 for Adults and £5 for Under-16s, which includes a programme. With the Swans playing at Bolton Wanderers the day before the game, which is just 14 miles away, it is an ideal opportunity for travelling Jacks to stay overnight and come along to the game to support Lenny – whilst ticking another ground off the list if you’re a ground hopper! The Swans Legends squad, managed by Kris O’Leary and Brian Flynn, is set to feature the following former Swans – Lee Bracey, Glen Morris, Steve Jones, Alan Tate, Michael Howard, Jon Ford, Leon Britton, John Williams, Adrian Forbes, Jonathan Coates, Chris Todd, Andy Robinson, Andrew Mumford, Tommy Butler, Kerry Morgan and Lee Trundle. Corey Glover will be the Swans legends physio for the game. A provisional Burnley squad for the game has also been announced, under the management Stan Ternent and Sam Ellis, with Ian Liversedge as physio. Some well known Clarets such as Brian Jensen, Dean West, Charlie West, Graham Alexander, Micky Mellon, Steve Davis, Ian Cox, Mitchell Thomas, Paul Weller, Chris Brass, John Mullin, Andy Payton, Gareth Taylor, Alan Moore, Tony Grant, Paul Cook, Andy Cooke, Ronnie Jepson, Glen Little, Robbie Blake and Francis Johnrose, are all set to feature for Ternent’s side. If you are unable to attend the game or would just like to make a donation, then you can do so via the Swansea Legends JustGiving page, which has already raised over £500 for the Len Johnrose Trust. 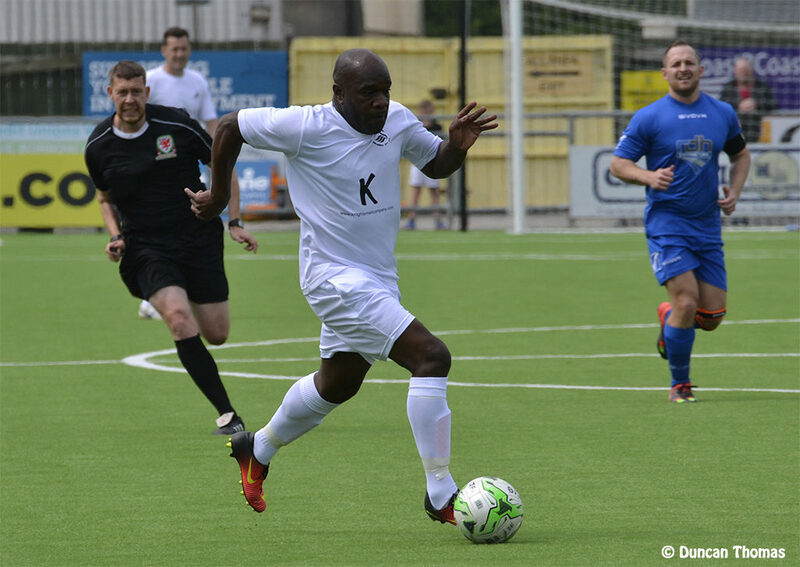 The two biggest donors will each receive a signed match shirt from the charity game, which will be personally presented to them by the Swans Official Club Ambassador, Lee Trundle. We hope that the game will be a huge success for Lenny and hope that a big crowd will be present to support him at this difficult time.